Chris Brown gets to keep his daughter Royalty despite being taken to court again by his baby mama Nia Guzman. The “Loyal” hitmaker stuck a legal home run when a judge denied all of Guzman’s requests against him and even ordered her to pay his legal fees. Seems the judge got fedup of her trying to deny Breezy the right to see his daughter. TMZ reported that Nia wanted the judge to award her full custody of their 2-year-old daughter Royalty. She also wanted Chris Brown to have monitored visits with his own daughter and wanted him to submit to a drug test. She went on to ask the judge to deny Breezy’s mother any right to see her grand child. All of her requests were denied in court on Monday. The current custom agreement will remain meaning Chris will have his daughter for 12 days out of every month. Nia Guzman has since withdrew her child support case where she wanted Chris Brown to pay her $16000 per month, a significant increase to the $2,500 that he is now paying her. Both Brown and Nia Guzman have had a rocky relationship from the start when news broke that they have a child together. They constantly bash each other on social media, with Nia accusing the R&B singer of being a bad father who do drugs around his own daughter. 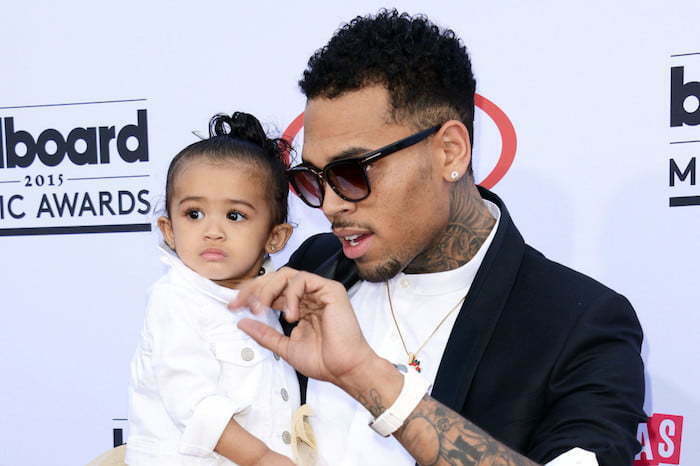 Chris Brown has denied all of her allegations saying that he just want to be a father to his own child. Aside from his legal troubles, Chris Brown is currently working on his new album due later this year. Bounty Killer son Major Myjah is among the producers on the album. Last month Myjah told Winford Williams that he has three contributed singles on the pending album, due for release later this year. Do you think the judge was too harsh on Chris Brown’s baby mama Nia Guzman? wow why is every case like this over more money, it should be over raising the child to the child’s needs. So sad of this, glad judge saw through it and didn’t make it about just money.